103 wild tigers were counted in Bhutan this year – a huge jump from the previous estimate of just 75. The survey was conducted by Bhutanese scientists and spanned habitats from snowy mountains in the north to subtropical forests in the south. World Wildlife Fund (WWF) worked closely with the Bhutan government to provide funds and technical support. The tigers were identified by their stripes, which, like human fingerprints, are unique to each animal. Like Bhutan, other countries have performed national tiger surveys with India, Russia and Nepal reporting higher numbers than previous estimates. Bangladesh reported lower numbers in its first national survey and Malaysia reported a drastic drop from 500 in 2010 to as few as 250. The numbers for tigers in Indonesia, Thailand and Myanmar are unknown. Poaching and habitat loss are the major threats to remaining wild tigers in Southeast Asian countries. There could be as few as 3,200 left in the wild and counting them is the first step in protecting and conserving these majestic big cats. Although surveys are expensive, labor intensive and often in difficult climate and weather conditions, the results are more than worthwhile. This year, seven lions were reintroduced to Rwanda, where the wild population died out a few years after the 1994 genocide. Two males and five females were taken a 30-hour journey from South Africa to Akagera national park, a 276,800 acre area in Rwanda that borders Tanzania. The park is equipped with electric fencing and the lions with satellite collars. Lions were wiped out in the region following the 1994 Rwanda genocide when refugees and displaced people killed the last of the lions to protect their livestock. But the endangered animal’s return symbolizes both a success for conservation and for the nation. Akagera is only about a two hour drive from Rwanda’s capital and an important tourist destination that could see a surge in popularity from the return of the lions. As of last month, the lion is still listed as vulnerable in the world by the IUCN with the threat of wildlife trade increasing. But Akagera park provides these animals with a safe, natural habitat where they can hopefully flourish. Park officials are also working to reintroduce rhinos in Akagera, which, if successful, would be another great conservation achievement. Good news for bobcats in California – the trapping and killing of these iconic wild cats has officially been banned. The California Fish & Game Commission voted to extend protections for bobcats, originally found in the Assembly Bill 1213, which was passed into California legislature in 2013. Despite the bill prohibiting trapping and killing of bobcats throughout the state, the ban was not fully implemented. But in August, the five members of the Commission voted to implement a full ban on bobcat trapping. A big push came from a Care2 petition demanding full enforcement of Bobcat Protection Act, which received more than 77,000 signatures. The Commission had to decide between a statewide ban on bobcat trapping or a zone-based approach that would have prohibited it in certain regions only. But the members voted for the former, proving to be one giant step for these beautiful felines. 29 scarlet macaws were released in the state of Veracruz in Mexico in late August, increasing the wild population by 36%. The species was almost wiped out 50 years ago from habitat loss and poaching for the pet trade, as the population was reduced from thousands to just 250. Defenders of Wildlife supports the Mexican National University’s Institute of Biology to reintroduce captive-bred macaws into the wild. All reintroduced macaws are identified by marks on their bills, tags on their wings and transponders they carry that receive radio signals. Some birds also have radio transmitters so that the biologists can track them to see where they go and what locations might be best for future releases. Each of the identifiers and devices also helps prevent poaching of the birds. The plan is to continue releasing macaws every three or four months for the next five years to build a stable population of 300-500 birds. Once these numbers have been achieved, Veracruz will be home to the largest wild population of scarlet macaws in Mexico. Releases are just one part of recovery efforts, though, as there is also an intense reforestation program to slowly bring back lost habitat. In addition, there are quick bird identification guides to promote bird watching that will provide tourist income to local communities and prevent poaching. Defenders of Wildlife has also created educational materials – including posters, children’s coloring books, and comic books for youths and adults – to teach the local communities about the importance of these birds and restoring the species to the wild. As the Arctic sea ice melts, it makes room for the ocean’s apex predators, killer whales, who even feed on other whales. More and more sightings of killer whales, or orcas, have been reported in the Canadian Arctic. Killer whales are not well-adapted to the Arctic, as evidenced by their large dorsal fins. But because of climate change, they are able to access waters in the Arctic Ocean that they were unable to previously. 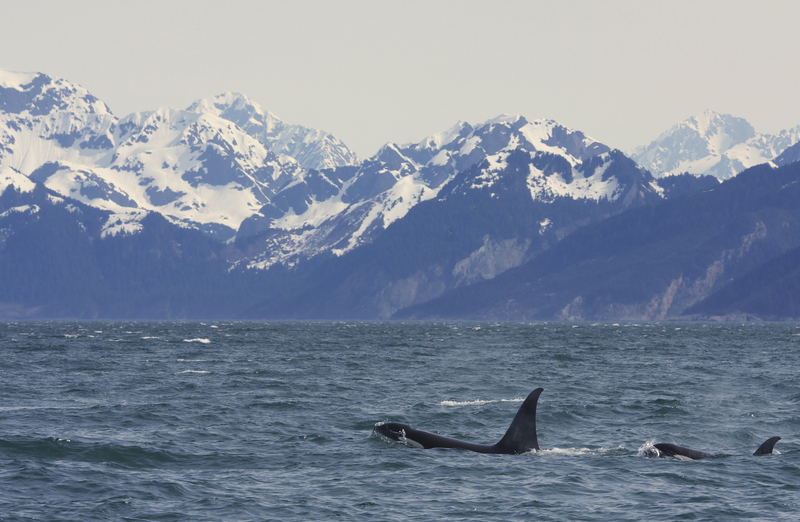 This has raised concerns about the killer whales altering the region’s ecosystem, on top of concerns about climate change in general. So far, killer whales have only ventured into the Canadian Arctic. But it’s possible they will continue to move further north, deeper into the Arctic Ocean, in the future. More research is needed to confirm their exact movements. The vaquita porpoise is one of the most rare and endangered porpoises in the world. And it’s disappearing faster than we thought. According to a report from the International Committee for the Recovery of the Vaquita, there are only 97 remaining on the planet. They are found only in the northern gulf of California and are most threatened by gill-net fishing, despite an emergency 2-year ban enacted by the the Mexican government in April. Data from acoustic monitoring shows that the porpoise population is declining by an average of 31% a year – a number much higher than the previous estimate of 18.5% and also the steepest decline of cetaceans on record. The population decline corresponds to local reports of an increase in illegal fishing for the totoaba fish, prized in China and used in food. Vaquitas are similar in size to the totoaba and thus get easily caught in nets meant for the fish. There once was strong law-enforcement in 2008, but efforts have faded to almost nothing until recently. Along with enacting the gill-net fishing ban, the President of Mexico placed the Navy in charge of enforcement. Several arrests have been made and aerial surveys show no gill-net fishing boats in the exclusion zone since the ban went into effect on May 9. Fortunately, the Mexican Ministry of the Environment and Natural Resources recently launched a comprehensive survey of the vaquita. With the assistance of NOAA Fisheries, the study will provide a baseline count for the population and allow the proper conservation strategies to be implemented. The survey runs for two months until early December and covers the species’ distribution, an area approximately 100 miles by 50 miles. It has two parts: a visual study from a ship with devices that can spot vaquitas up to five kilometers away and an echolocation study with “acoustic buoys” that can track the animals underwater. The vaquita’s last survey by ship took place in 2008 and found the population to be 250, a drastic drop from 600 in 1997. Today, scientists know that there are less than 100 of the species, but the data from the study can provide more insight into exactly where and how many vaquitas exist. There hasn’t been a wild gray wolf sighting in California since 1924. Until this year. The wolves were spotted in August in the woods in the northern part of the state, near Mount Shasta, and consisted of two adults and five pups – believed to be only a few months old. Officials learned of the pack, called the Shasta Pack, from cameras posted around the area after speculation of its existence. In May, nearby cameras captured images of a large, dark-colored animal that experts thought could be a wolf. And then in June, researchers studying a deer saw tracks from either a wolf or a dog. Gray wolves were hunted to near extinction in western U.S. They are now protected in California under the Endangered Species Act, which is contributing to the wolf’s slow rise in numbers. The presence of this Shasta Pack may indicate a comeback for gray wolves in California. Climate change is the latest accomplice to whale hunting: as temperatures rise and sea ice melts, it opens more paths for people to find and kill whales. This summer marked the first time that an Icelandic whaling vessel was able to travel through the Arctic’s Northeast Passage and hunt endangered fin whales. Near record-low numbers of sea ice opened the passageway, which is not normally accessible to larger vessels. Ignoring an international ban on hunting these endangered whales, the vessel carried 1,800 tons of frozen fin whale meat to sell in Japan. It left Tromso, Norway on August 1 and arrived in Osaka, Japan later that month with almost 40% of the whale meat the entire country consumes annually in just one shipment. This is a detrimental in several ways. First, a northern route will allow whaling vessels a shorter path to Japan, their main buyer. Second, it raises concerns for activist groups like Sea Shepherd who focus mostly in the Indian and Southern Oceans and can’t expand north. The mountain gazelle – found in Israel, Golan Heights, Turkey and across the Arabian Peninsula – is now endangered. Or at least it should be, according to scientists who counted just 2,000 of the species after a drastic drop over the last 15 years. Zoologists are recommending that this iconic mammal of the Middle East should be placed on the endangered list for protection. They fear that the tan, white and black gazelles could end up extinct like their closest relatives who once lived in Egypt and Syria. This specific gazelle species is significant because it is thought to be unique to Israel and a few surrounding countries. According to the Israel Nature and Parks Authority, the gazelle population in Israel declined from over 10,000 to just 3,000 in 2008 alone, a rapid decline that seems to be persistent. Moreover, only 200 of the gazelles are left in Turkey, leaving the population in Israel as the last significant one.